At first sight Siemens S55 is rather controversial model. On the one hand, it is awaited on the market as any top model of this company, on the other – the phone is almost identical to SonyEricsson T68i, which has been sold about a year. Siemens S55 differs in polyphony and Java, but some functions are simpler as there is lesser free memory space. In spite of this, S55 is one of the most advanced phone today, which includes all modern technological elaborations. SonyEricsson T68i was a leader, it surpassed its time and remained mainly a phone aimed to prosperous people, on the contrary, Siemens could become a mass model this year. It will be surely a sales hit. Firstly, design of the phone made in the way, traditional for Siemens, will be appealed to majority of Siemens fans. Secondly, the phone is appeared at that time when there is an ever-growing demand of bluetooth compatible handsets, but not much of them are available on the market. Finally, there are many other interesting functions in this model. But let’s start from the very beginning. The phone is available in two colours - Sterling Silver and Arctic Blue. As a matter of fact the colour of the phone determines a colour of the screen rim and colour of keys; sides and rear part of the phone remain always the same colour. We have an Arctic Blue phone as a test sample. A cover of the battery also was of this colour, it’s rather unusual and considerably changes the phone design. Handset dimensions are 101 x 42 x 18 mm, what allows to wear the phone in a pocket of shirt or jeans. It’s rather convenient. The phone weighs 85 g.; and it’s an optimal weight. You don’t feel the phone in your hand, but on the other hand, it’s not very light. So everything is balanced. For the first time colour screen is used in the phones from Siemens. One can argue remembering such models as Siemens SL10 or Siemens S25, which also were equipped with a colour display. But it’s not really so. There were no full-colour displays in those models, they could not exist because the technology was not perfect at that time. Pseudocolour was applied there and it was a good compromise decision. Of course, we can argue about the terms. But in my opinion colour screen means a screen where at least three pure colours can be displayed. And, for example, in Siemens S25 only colour hues were displayed. 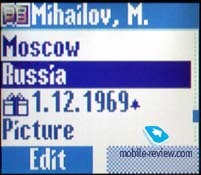 A graphical display used in Siemens S55 could show up to 256 colours, its resolution is of 101x80 pixels, what allows to display up to 4 text lines, a title and a line with tips to the soft-keys use. The information is quite readable, but in sunny day it’s rather difficult to use the screen. 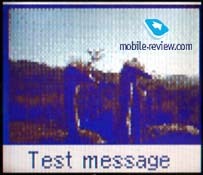 The quality is comparable to the screen of SonyEricsson T68i but worse than, for example, displays from Nokia or Samsung. There is a nice setting, which allows to adjust display backlighting level and select a contrast. 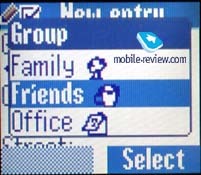 There are also colour schemes in the phone, which change standard windows and menus view. Several schemes are available by default, later you can download new ones. The phone idea is the following: you decide yourself what and how much you want, engineers only show you the capabilities of the phone, the rest you select yourself. For example, your humble servant downloaded a new screen saver and ringtones. Two soft-keys and 4-directional navigation key are positioned under the screen. All keys are made of plastic, alphanumerical keys are terraced. They are very handy, in spite of that they are spaced too closely to each other. The same I cam say about menu navigation with a help of control key, at least in three directions. It’s not always convenient to scroll a menu up. It’s the only shortcoming of the keypad. If to put the phone face down, you can notice that it lies on the soft keys, if you press a little bit, they will be pressed too. To avoid it, better to use manual or automatic keypad lock. Usually it solves all such kinds of problems. An interesting situation was when I used a holster of a bigger size than the phone. Sometimes the keypad was unlocked when I stooped down and pressed the holster. Don’t pay much attention to this fact; it’s not a typical situation for majority of users. 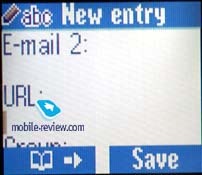 A double volume key is placed on the left-hand side of the phone, it is used to display and change current profiles. 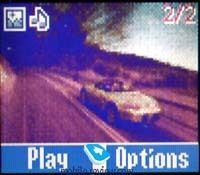 Here an Infrared interface is also located. 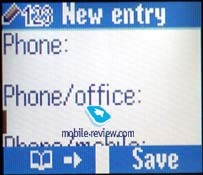 A special dictation key is positioned on the right-hand side of the phone. A system connector is placed on the bottom of the phone, it differs from that, which we saw in 45 series and similar to 55 series. Few words about the battery. It is lithium-ion of 700 mAh capacity. According to the manufacturer standby time is about 220 hours and talk time is almost 6 hours. In reality the phone worked about 4 days in case of 45 minutes of talking (Beeline network) and one hour of using other applications. We should pay attention that one day the phone worked in bluetooth mode with compatible bluetooth device. If you are not going to use bluetooth headset, operating time will be increased to 5 days. Autonomy of the phone surely reaches 2-3 days while active using of all phone functions. But if you have to talk several hours a day you’ll have to re-charge the battery every day. A time of full re-charging is less than 2 hours. As for me operating time of the phone is comparable to SonyEricsson T68i. A screen is traditional for Siemens in the standby mode, you can add any function to the left soft key. When you enter a main menu, you’ll notice several changes. 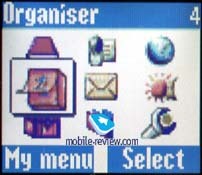 It is represented as 9 icons, what strength the similarity with SonyEricsson T68(i). Submenus remain the same, they look like lists of items. 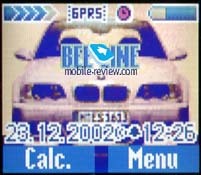 Any user of the phone from Siemens is get acquainted with such interface. It’s possible to use a shortcut number navigation to move through the menu. Let’s turn to main submenus. Phonebook. This handset has a dynamical memory. 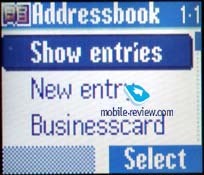 In the phonebook not more than 500 entries can be stored. 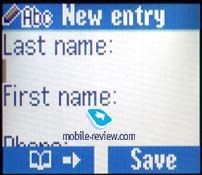 You can add such fields as name, first name, phone, mobile, two faxes, two e-mail addresses, URL, company, its address (city, street, post code, country). Besides you can input a birthday and activate a reminder to know about the day in time. It’s also possible to assign a graphic file, for example a photo or just a picture to each entry. Up to 20 voice tags can be added to certain phone numbers. Voice recognition doesn’t work always correctly. It’s necessary to pronounce a name immediately after a beep; otherwise, even a right voice tag will be ignored. It is more important, when you try to use voice dialing in bluetooth mode. 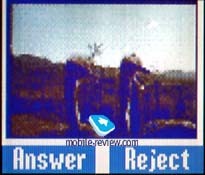 In this case a recognition is worse, probably because of noise, which is registered by the phone. S55 can receive records from other handsets or PCs. There are no problems while transmitting; all fields are synchronized correctly. Unfortunately, we didn’t have an opportunity to check original software for synchronization, but there are no doubts that it also works without problems. All phone numbers can be divided into 9 caller groups. 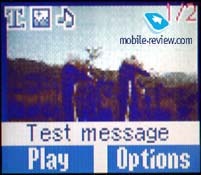 Special ringtones can be added to each of the group. It’s the first time when there are so many caller groups in Siemens. Now it’s easier and more pleasing to work with a phonebook, which has wider possibilities. Messages. Up to 100 messages can be stored in the phone memory, but in fact their quantity depends on free memory space, don’t forget it. 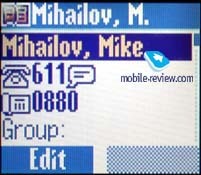 In the total list all phone numbers (from both phone memory and SIM-card memory) are displayed on the screen. Phone numbers from SIM-card are marked by a special sign. You can create SMS templates and special folders in this menu. This model supports MMS; all settings are rather simple, using tips of your operator, you’ll need 3-4 minutes to set everything. 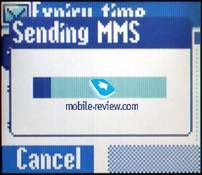 It’s obvious that it’s better to use GPRS to receive and send MMS messages, it’s much cheaper. I wasn’t delighted with an interface while creating messages. You can’t move quickly between pages, and you should call a context menu to know, how many pages you have in your message. 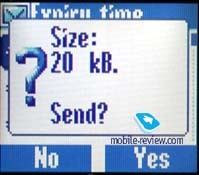 A message size reminder, which is displayed before sending a message, is very pleasant. 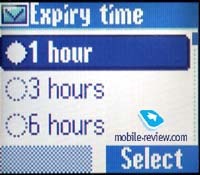 You need also to input a time period (one hour – as long as you want), during which the message will be delivered. If you pay for the messages size (depends on operator) it’s a rather important function. 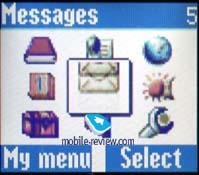 You can receive MMS manually or automatically. Besides, you can decide would you like to receive message in roaming. It’s interesting that sometimes, when you are in automatic mode, the phone gives a notice that this way can be expensive. There wasn’t any difficulties to send a message (30kb) in Beeline Network, all the messages were sent correctly and a corresponding addresser received a delivery report by SMS. 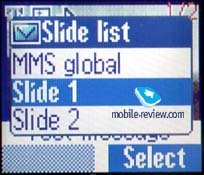 Unfortunately, we were not able to download a message as operator’s equipment supports automatic receiving MMS messages only in few models, but not in Siemens S55. Mail client supports up to 4 accounts. Its capabilities are similar to Siemens S45i.